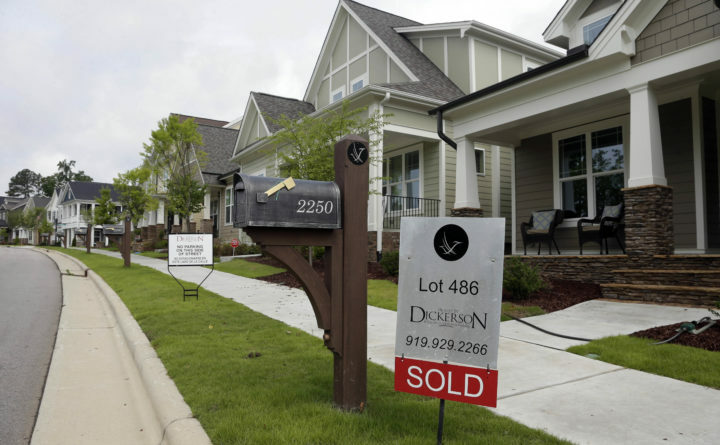 A "Sold" sign is displayed in the yard of a newly-constructed home in the Briar Chapel community in Chapel Hill, North Carolina, June 9, 2015. The homeownership rate in the U.S. increased in the third quarter, a sign that first-time buyers may be seeing the cooldown in housing as a buying opportunity. The share was 64.4 percent, according to a Census Bureau report Tuesday. It was up from 64.3 percent in the previous three months and 63.9 percent a year earlier. The fevered price gains of the past six years are slowing, meaning more buyers can take their time to find the best deal without the pressure of bidding wars. The recent jump in mortgage rates has also taken the edge off demand. With such a large population of Americans under 45, the homeownership rate can still rise as more renters make their first purchase, Tian Liu, chief economist at Genworth Mortgage Insurance, said before the announcement.